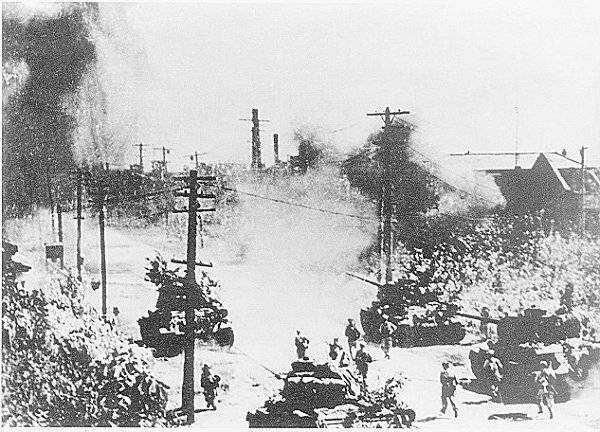 Geochang massacre occurs during the Korean War. The Geochang massacre was a massacre conducted by the third battalion of the 9th regiment of the 11th Division of the South Korean Army between 9 February 1951 and 11 February 1951 of 719 unarmed citizens in Geochang, South Gyeongsang district of South Korea.The victims included 385 children.The 11th Division also conducted the Sancheong-Hamyang massacre two days earlier. The general commanding the division was Choe Deok-sin. In March 1951, Shin Chung-mok, a leading assembly lawmaker from Geochang reported the massacre to the National Assembly against South Korean Army cover up.The National Assembly’s special investigation team investigated, but was hampered by the South Korean Army’s interruption.Shin was arrested and sentenced to death in an Army court martial.In May 1951, the second investigation team was dispatched by the National Assembly and they reported the South Korean Army involvement. After the investigation, Major Han and Colonel Oh Ik-gyun were sentenced to life in prison by a military court. President Syngman Rhee subsequently granted clemency to criminals.This massacre is pointed out as an example of oppression under his rule.In April 2004, the Geochang Massacre Memorial Park was founded in memory of the victims, in Geochang.On 20 February 2006, National Archives and Records Service reported the files about the massacre were found.